You will need to be on the quest Jedi Prisoner to be able to enter Maelstrom Prison (you do not need to have completed it). Power Punch: This one only affecting tank (or highest threat target), it will knock the tank up in the air so face him to a corner if possible so that you get knocked up against the wall and not land on the other side of the room. Punishment: This is the only ability you have to worry about, he will pull 2 party members to him and start channeling Punishment, a 4 second cast. You need to run far away from the boss as possible. At end of the cast, if you are not far enough, you get hit for massive AoE damage (hit me for 9k without any damage reduction). You might be able to Line of Sight to avoid this ability if your healer is struggling top the group up in between Punishments. Based on the kills I have done on this boss, it appears he will pull the two closest person to him that are not tank for Punishment, so squishies should stay at max range if possible. The basic pattern is Power Punch –> Punishment –> Power Punch – > Punishment, etc. This is a fun boss, he isn’t hard as long you know the strat for defeating him but unwary groups might have their members get one-shotted. This boss isn’t too melee DPS friendly due to one of his mechanics but it is certainly doable. 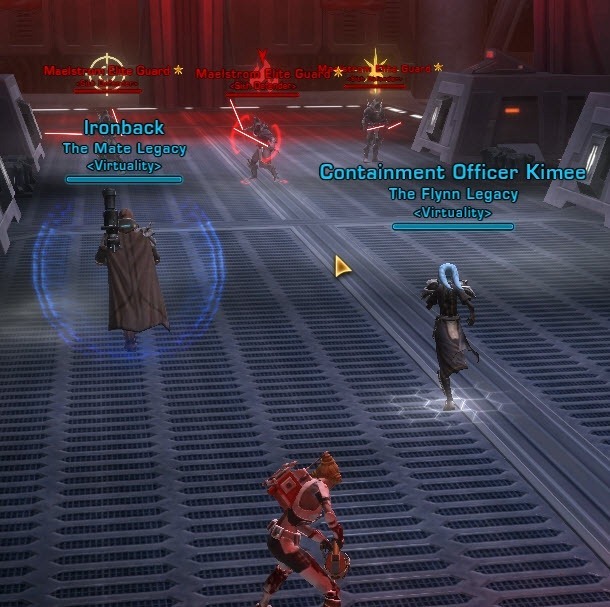 He comes with two normal adds (Daksh Overseer Droid, 5 k HP each) that can be pulled from behind him and killed separately if you are super cautious about this fight. Grapple + Carbonize: Nothing major, he pulls you in and stun you for a few seconds. More of an annoyance than anything. You can avoid it by running into the boss when you get pulled in. 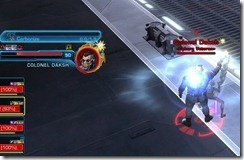 Wrist Laser Burst: One of his standard attacks and it is interruptible. You can interrupt it if you want but it doesn’t do a lot of damage. Smash: Performed right before Daksh goes into his laser optical phase, knocks everyone around him back and deals around 4.4 k damage. The range on this knockback is quite far so you need to stand pretty far away to avoid it. 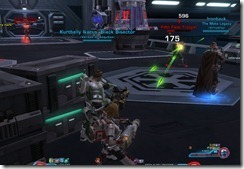 Laser Optical phase is a special phase during the fight where you have to be super careful about your positioning and aggro or you will risk getting one or two shotted by Daksh. It lasts about 30 seconds (You can see when the buff wears off and there is also an onscreen red text when this happens). 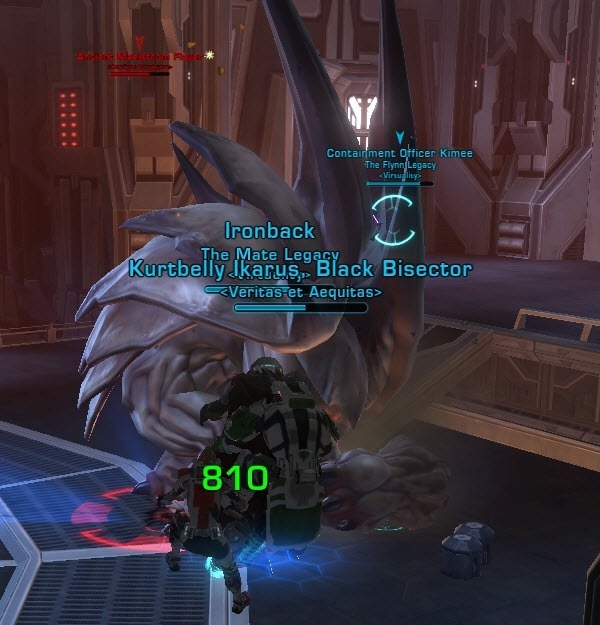 There does not seem to be a fixed % on when this phase occurs but in the couple runs where I have killed Daksh, he enters this phase twice in the fight, first time around high 50s and second time around mid 20s in terms of health percentage. Smash, mentioned previously, is performed right before this phase. 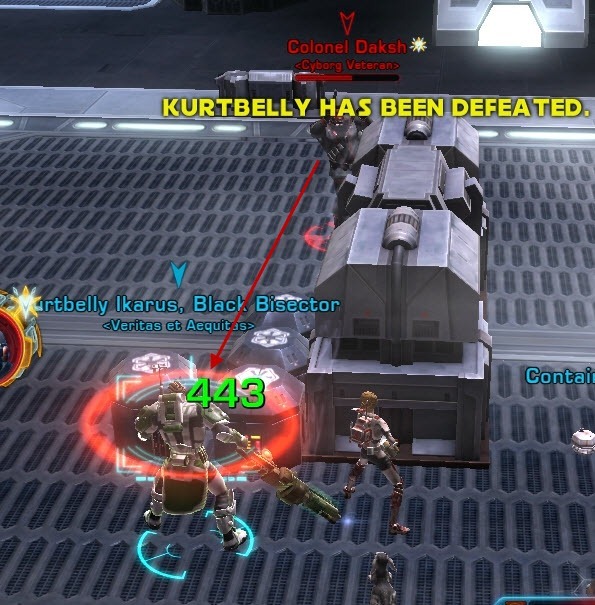 On screen red text: Colon Daksh is Charging his optical implants! 5 second cast of a spell called Laser Eye Charge that cannot be interrupted. Once this spell finishes casting, he will enter his laser optical phase. During this cast he is immobilized and this gives sufficient time for tanks to generate aggro and DPS to run away to hide behind boxes. During this phase, tank need make sure they have aggro and start running around the boxes in the on either side of the room. 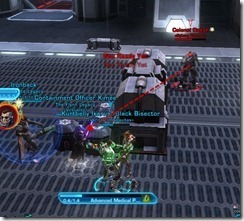 You must put the box between you and Daksh so that Daksh is out of line of sight for his laser zap. Failure to do so will cause you to get zapped for about 70-80% of your health and then he will then switch to DPS and healers in the group and proceed to zap & kill them if they in line of sight. 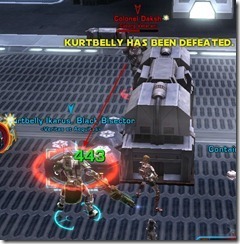 Tanks can use their AoE taunts while avoiding line of sight with Daksh. DPS can certainly do damage to Daksh during this phase but they must be careful to not pull aggro off the tank and hide behind the boxes immediately if they see the tank gets zapped. This phase is particularly hard for melee DPS as they may not have the time to run and get out of line of sight if they pull aggro or tank gets zapped. Ranged DPS have the luxury of peaking their heads out to DPS and pop back to cover right away if things goes awry. Something to keep in mind is that the barrels near the boxes will not provide protection from Daksh’s laser zap (they are not tall enough). Very easy miniboss, he releases a bunch of normal adds during the fight (around 5k HP). Just focus on burning down Kancras. This is the bonus boss that can be unlocked if you complete the multi-stage bonus mission – Painful Employment. He is pretty much a tank and spank kind of fight except he has a very nasty knockback called Smash that deals around 7k damage to all group members and knock them quite a distance away. For this reason, tank should position him to a wall so that they don’t get knocked too far off. The knockbacks don’t come that frequent so healers should have plenty of time to top everyone up before the next knockback. DPS should burn down the Shriek add first and then focus on Vanithrast as some of Vanithrast’s abilities doesn’t seem to activate until he gets down to a certain % in health. 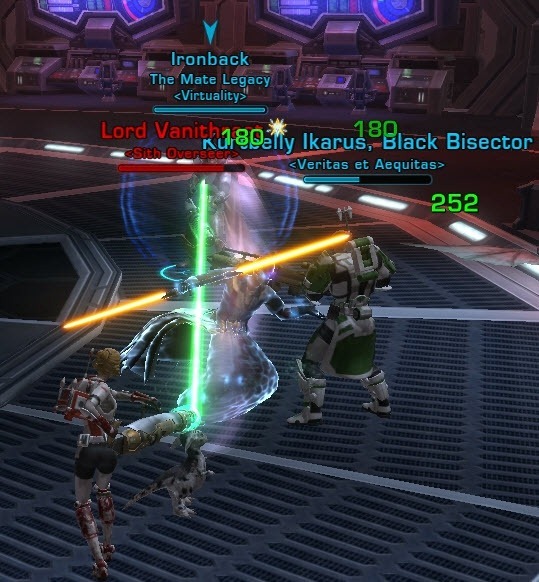 Vanithrast has an ability called Spinning Strikes that deals around 2.5k damage per tick to players near him in a 360 degree. 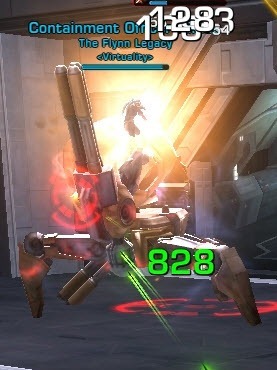 Melee DPS should move away from the boss when he performs this ability (it is a 6 second channel). This ability does not seem to be interruptible even though Vanithrast does not get the interrupt immunity buff when he performs this ability. He will force speed to someone after popping out of stealth and then proceed to stab them for 8k damage. This is followed by a 3 second stun/force choke for the next 3 seconds. Tank will need to taunt Vanithrast back when this occurs. Vanithrast is buggy sometimes and will not go stealth if the target for his next Spike is near him. He will instead turn away and directly stab the person, killing them if they are low on health. This is not a boss fight but rather 3 elite trash mobs near the final boss room that cannot be crowd controlled. They hit the tank extremely hard when all three are alive so DPS should focus on burning them down one by one to lessen the load on the healer. Kilran is the last boss of the flashpoint. This fight isn’t really hard as long you stay out of line of sight of Kilran’s abilities. There are 3 phases associated with this fight. Phase 1: Kilran is guarded by 2 strong adds called Fifth Fleet Bodyguard, DPS should burn down the two adds first and then attack Kilran. Kilran won’t take much damage before he transitions to phase 2. Phase 2: Kilran will station himself at the end of the long walkway immediately before the ramp, all party members will have their movement speed slowed by a debuff that cannot be removed (only last for a bit). During this phase, Kilran will cast Snipe (3 second cast, hits for 9.6 k) and Series of Shots (3 second channeled cast, hits for about 2k per tick), neither of which can be interrupted. 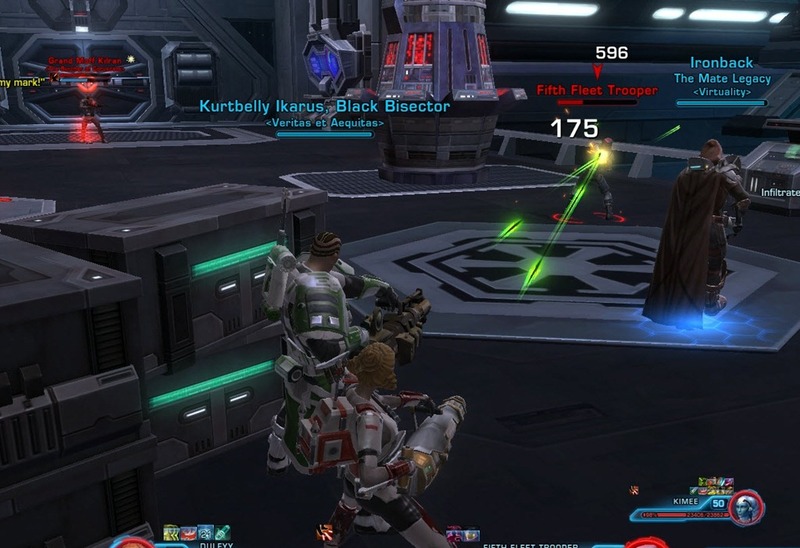 Everyone should move up by using the pillars to stay out of line of sight of Kilran and avoid his abilities (mostly Snipe). In addition, Kilran will summon a bunch of normal adds, DPS should make a quick work of them since they don’t have much health. 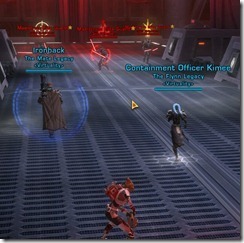 While moving up, ranged DPS can damage Kilran from behind the pillars. 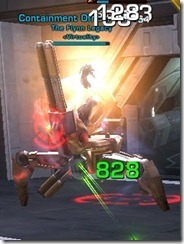 Melee DPS can kill off the adds and move up close enough to use their gap closers to close the distance to Kilran. Once you damage Kilran to 50%, he will do a knockback and start Phase 3. Phase 3: Phase 3 is not too different from phase 2. Kilran will at the end of the walkway after you get on the ramp. There is a box conveniently placed for you to dodge Kilran’s attacks after you get off the ramp. Kill off the adds and then finish off Kilran. Watch out for snipe and try LOS that ability if possible! 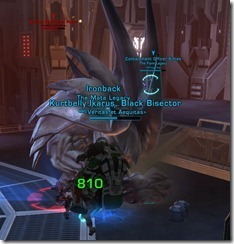 first boss, my guild’s taken to nutting up for punishment. slap an aoe heal down, and toss some heals the dps’ way. damage to tank isn’t rough and the fight is fast. helps to be geared, but just staying under him saves a lot of time and confusion. Hey there, just as an FYI, I am going to be stealing all your guides and re-publishing on my site. Major kudos to you. FANTASTIC job!! I’ve done this raid a lot of times on normal mode and am wanting to do it on HM for HK part. I am currently geared at 208 do I actually need to be the recommended 220 level or am I good at 208?